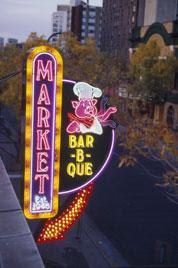 When I think of Market Bar-B-Que one word keeps popping into my head, atmosphere. The American Heritage Dictionary defines atmosphere as “An aesthetic quality or effect, especially a distinctive and pleasing one, associated with a particular place” and it is for this reason that I usually choose to keep going back to Market Bar-B-Que. The food is usually ok, service ok, drinks ok, but the atmosphere is warm, cozy, and inviting, somewhat reminiscent of the old supper clubs I used to go to as a boy growing up in Southeastern Wisconsin. Peggy and I ventured out around 8pm on Saturday which is late by Minnesota standards. (in New York or L.A. they are still serving the senior specials at 8pm) Market Bar-B-Que is tucked in an obscure corner just off the frontage road on the north side of 394 and is surrounded by office complexes. The building has an interesting design in that it is half submerged underground. As you walk up the familiar glow of neon lights comes from the windows. They have one that looks like their pig mascot...very cute. The heavy wooden door in the entryway has an old metal knocker on it in the shape of a pigs head leading one to believe that pork is the dominant theme at this establishment. As we ventured indoors, through the vestibule, we are immediately embraced by the atmosphere. Walking past the candy machines, free local magazines, and an old coin operated pig that the children can ride a smallish bar sits to our right. It never seems busy, but I can't help but think it used to be the “place to go” in days gone by. After all the Market Bar-B-Que has been a Twin Cites institution since 1946 when it took its name from the nearby Farmers Market in Minneapolis. Granted this suburban location didn't come into existence until years later, you can't help but take comfort in a restaurant chain that has been around for over 50 years. Seconds after being seated our server jetted over and brought us menus and asked if we wanted anything to drink. Peggy and I both ordered Skye vodka martinis on the rocks with olives. ($7.95) A very short while later they arrived in a small tumbler filled to the rim. We both enjoyed them and were happy with how they were made, but we found the price to be too high for this caliber of restaurant. The server then asked if we wanted an appetizer and we inquired about the Seasoned Chicken Wings. ($8.95) She said they were fantastic so we proceeded to order. Not long after a plate of 5 whole chicken wings was brought to the table accompanied by a bowl of their homemade barbecue sauce. I honestly have to say, they were pure heaven. Smoked to perfection served crispy and piping hot with a great seasoning (think Lawry's) that didn't mask the smoked flavor of the meat. If you get a chance try these, we think you will be happy you did. My ribs arrived served on a fiberglass serving tray, a small version of the ones you would see at a cafeteria line. It actually is a nice idea since ribs would easily fill up a plate and not leave enough room for the sides. Speaking of sides, I had the french fries which are the default potato choice unless you want to pay $1.50 more for a baked potato. Also served with my meal was creamy coleslaw and Texas toast. My ribs were served dry (no sauce) and they were precut about ¾ of the way through between each bone. Although they were not as tender as I like, they tasted very good. The rub of seasonings used along with the smoky flavor made up for the lack of tenderness. The coleslaw was creamy yet crunchy and had a slight garlic and horseradish overtone. The french fries were not very hot, but they were crispy and I enjoyed dipping them into the barbecue sauces. I don't know how, but some restaurants manage to ruin simple toast. This was not the case Saturday night. The toast was buttered yet crispy and made for a great accompaniment for the meal. Peggy's Beef Brisket arrived piled high on Texas toast with grilled onions and barbecue sauce slathered on top. The pink meat was lukewarm, but had a great smokehouse flavor and was very tender. Peggy opted for a baked potato instead of fries. The potato was baked perfect and seemed fresh. She also enjoyed the coleslaw as much as I did. We were so stuffed by the end of our meal we opted out of dessert. If we wanted we could have chose from a variety of sweets such as Key Lime Pie, Mud Ice Cream Pie, and Sweet Potato Pie to name a few. Service, as I mentioned earlier was extremely fast. The server was never far away and quick to fill our order. While I would giver her an A for efficiency, I would give her a C on personality. Very short abrupt answers to questions and not much feedback when we initiated conversation. I should also mention that we did need to ask for water with our meal and the glasses were never refilled even though they sat empty for quite some time. The food and drinks were better than usual this time and the service was prompt. Yes, we both agree the prices are too high for this type of restaurant. Paying $1.50 extra for a baked potato or $2.50 extra for a dinner salad instead of coleslaw seems a bit silly especially when entrée prices range from the low teens to the upper twenties. 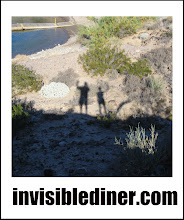 But overall we had a pleasant experience and we will no doubt go back for more. As we were getting ready to leave, Peggy and I looked around the dining room and smiled. It was decorated with white and orange mini lights and pumpkins with a backdrop of red porcelain tiled walls, alcoves separated by glass dividers, and the red hue of the neon lights. Warm, comfy, and cozy was the reason we came and we weren't disappointed by the atmosphere. Yes, sorry for the long absence. We will have a new review up today. Thanks for visiting.